The crispiest spatchcocked chicken you’ll ever have! A couple simple tricks ensure crispy-skinned, succulent roast chicken! I add a few spices for a subtle Eastern Mediterranean flavor. 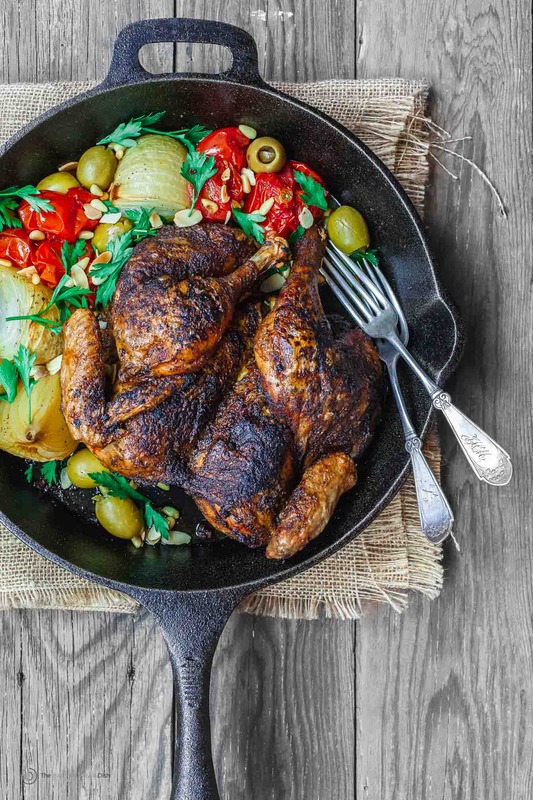 A simple whole roast chicken is one of those comforting meals every home cook should be able to make. But I’ll be first to admit, when it comes to roasting the bird whole, achieving perfection can be tricky. One of the common problems is that chicken breasts dry out before the legs come up to appropriate temperature! The answer to this pesky problem? Spatchcocking. Spatchcocked chicken is basically when the bird’s backbone has been removed. The chicken is split open and can more easily lay flat, which allows it to roast more quickly and evenly than an intact bird. So with a “flatter” chicken, we have more surface area for browning. 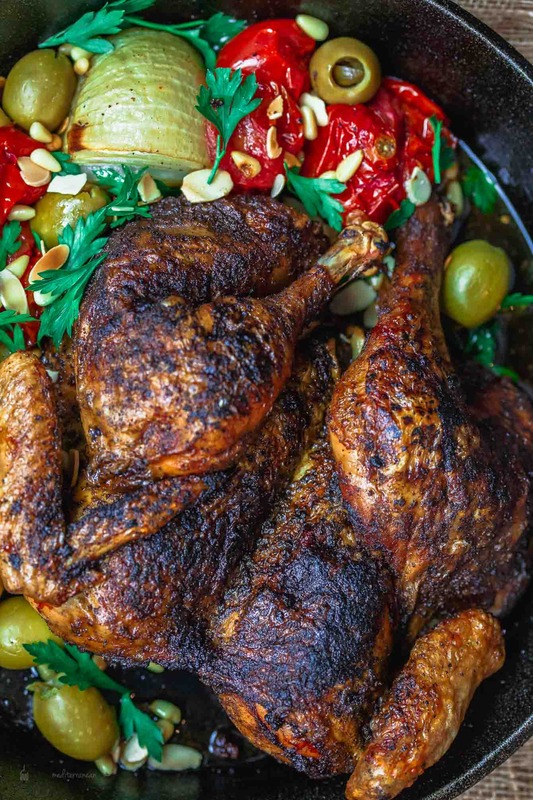 But, in Salt Fat Acid Heat, Samin Nostrat shares one of the simplest tricks to attain a delightfully succulent, crispy-skinned bird. Her trick, in one word: SALT. And when it comes to whole spatchcocked chicken, salt early. Seasoning in advance–overnight–gives salt plenty of time to diffuse evenly throughout the bird, doing it’s quiet work of flavoring and tenderizing. But another element that is equally important here is air. The generously seasoned spatchcocked chicken is refrigerated overnight, uncovered. The constantly circulating air dries out the skin. The bird will look, as Samin puts it, “scarily fossilized.” But, the dried-out skin cooks up golden and glassy…the crispiest! 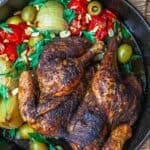 I used Samin’s techniques, but added my own little twist–a few of my favorite spices to give the chicken a subtle Eastern Mediterranean flavor. Cook’s note: If you don’t have time to salt the chicken and refrigerate overnight, do this as early as possible the day of. Pat the chicken dry with paper towel before continuing on. Recommended for this Recipe Our Private Reserve Extra Virgin Olive Oil; Allspice and Spanish sweet paprika. SAVE! Try our Ultimate Mediterranean Spice Bundle! Or create your own 3-pack or 6-pack of premium all-natural and organic spices! This was our Easter meat. Can I say fantastic? 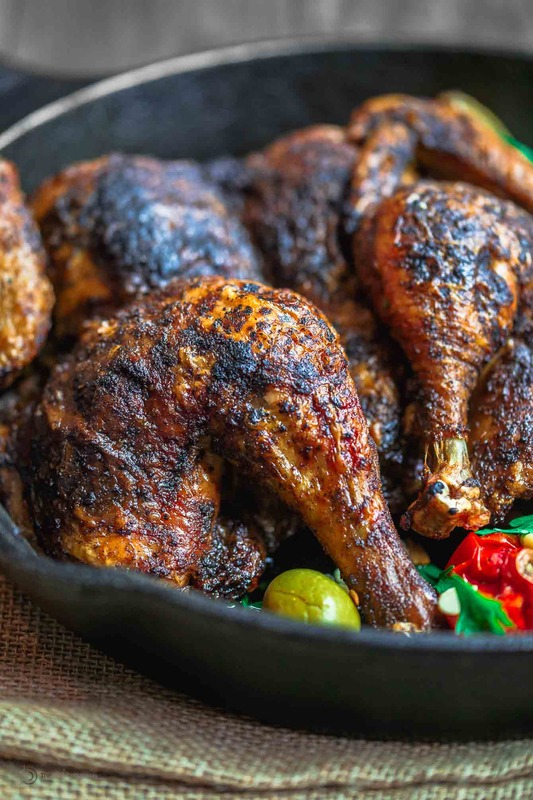 Hubs and I are the perfect pair to devour a chicken–I do dark meat and he does the light. This time, with this recipe, he had to fight me just a little bit for the chicken breast. It was the juiciest ever! And the spice mix was so savory! 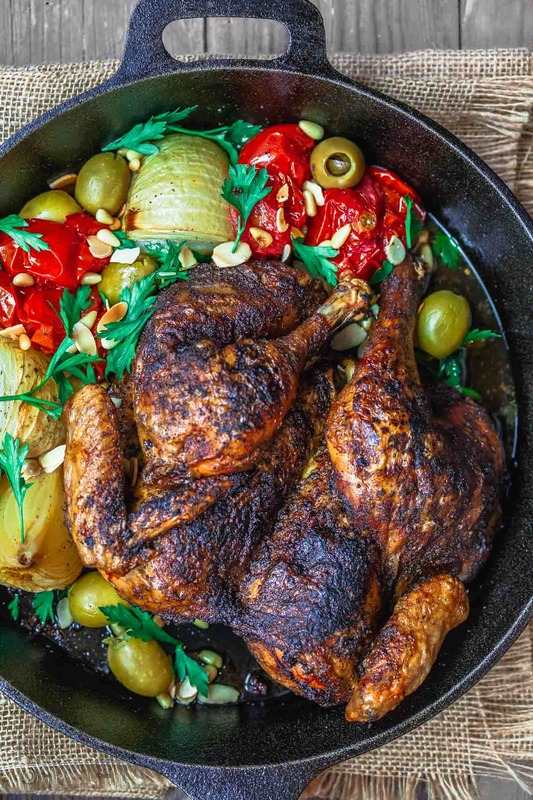 This will be our go-to for a roasted chicken recipe from here on. Thank you! Judith, this is wonderful to hear! Thank you so much for sharing. Sounds like a successful Easter meal! I got up early to prepare the chicken for tonight’s dinner. I know that’s not the proper amount of time to air dry. Did I ruin it by starting so late? It will have 13 hours rather than 24. Marcie, so sorry I am not always able to get to questions as quickly as I like. Any amount of time you are able to season the chicken and let it air dry in fridge will do the chicken some good. Hope you enjoyed it! This recipe was easy to follow and easy to enjoy (also fun to get the family to say spatchcock and learn a new word). The resulting chicken was just perfect. I had seen a comment on another recipe that someone was going to add a bit of aleppo pepper to the spice blend so did that as well and it was a nice addition. Definitely keeping this one in the recipe binder! Awesome, Sharon!!! I’m so so glad you enjoyed. I suggest that you add oven temperatures, in Celsius degrees too, as you have readers all around the world. From my experience, the chicken is not too salty 🙂 I’ve followed this tip a number of times, and without fail, succulent chicken with perfectly crisp skin. We love it. Can confirm, chicken doesn’t come out too salty. My husband typically salts everything and specifically commented the chicken didn’t need it but wasn’t salty either. He was the one who salted the bird the night before too! The spices that cook into the chicken during roasting blend nicely and the resulting meat is just very moist and tasty. And thank you for sharing this feed back too! Helpful for others to hear this!!! How much salt is everyone using for one chicken? This sounds delicious!